Four-in-one bucket design: Can be used as a standard bucket, clamshell bucket, grapple, or dozer. Jaw pivot pins have greasable hardened bushings: Bushings can be replaced if needed. 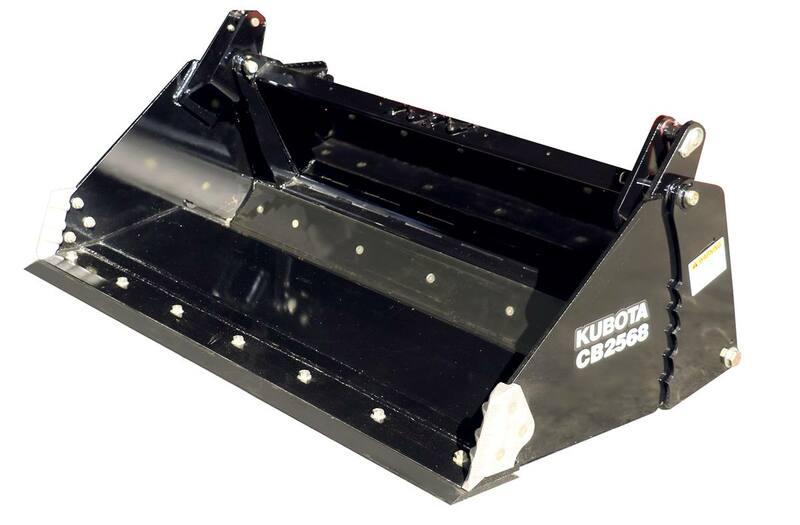 Reinforced bucket: Adds strength and rigidity to the bucket, clamshell, and dozer features of the four-in-one bucket. Serrated interlocking grapple teeth on bucket side panels: Various sizes, shapes, and weights of objects can be picked-up and held securely in the serrated teeth. Replaceable bucket side cutters: Stiffens and protects bucket front side panel corners. Reversible and replaceable clamshell blades: Reversible blades extends the life of the blade and can be replaced to extend the life of the bucket. Reversible and replaceable front cutting edge when included with jaw: Reversible front cutting edge extends the life of the blade and can be replaced to extend the life of the bucket. Replaceable tooth tips when teeth are included with jaw: Can be easily replaced as they wear or break. Spill guard: Helps protect the operator against spills over the back side of the bucket and increases capacity. Counterbalance valve: Prevents hydraulic bleed-off / improves cylinder control. Without teeth: 996 lb. ; With teeth: 943 lb.